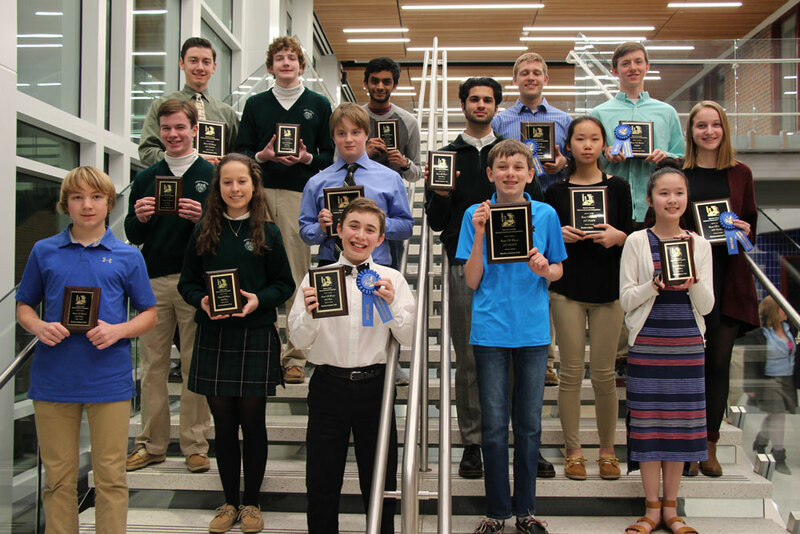 Awards and prizes were awarded at the Chester County Science Research Competition Award Ceremony on Monday, March 19. Best of Show winners display their awards. Chester County’s future doctors, engineers, mathematicians and scientists took the stage on March 19 for the 2018 Chester County Science Research Competition Awards Ceremony. They were there to celebrate the work of the 561 young scientists who competed in the Chester County Science Research Competition earlier this month, bringing together students from 56 Chester County schools in grades 4 through 12. In addition to exploring their interest in the sciences, students also competed in the hopes of winning a number of awards and recognitions. In grades 6-12, one of these recognitions includes the chance to advance to the Delaware Valley Science Fair, where students have the opportunity to win over $1 million in combined college scholarships. Though the Chester County Science Research Competition project categories are predetermined, the specific topics of the projects are limited only by the interest and imagination of the students. The competition, which is sponsored by CCRES and coordinated by the Chester County Intermediate Unit (CCIU), was held at the Parksburg Point, a new venue this year that was graciously donated by the organization. Students in grades 6 through 12 competed in the Lucy Balian Rorke-Adams Fair on March 13, and students in grades 4 and 5 competed in the Jonas Salk Fair on March 14. The participants competed in 15 categories, including: Behavioral and Social Science, Biochemistry, Botany, Chemistry, Computer Science, Consumer Science, Earth & Space Science, Engineering, Environmental Science, Mathematics, Medicine & Health, Microbiology, Physics, Zoology and Team Projects. Topic ideas can be sparked by anything from the desire to find a solution to a household problem to career aspirations in the field of science. And sometimes, from those sparks, a passion for the topic is ignited. Tenth-grade Great Valley High School student Kevin Guo is well on his way to finding a more effective cancer treatment. This is his fourth year in the fair and his second working with the cell-penetrating peptides and antibody-gold nanoparticles (GNP) which have been found to better target cancer cells. The process included imaging cancer cells, applying the cancer-treating antibody-GNPs with and without the peptide and measuring the amount of GNPs that ended up in the cancer cells. Guo found that the cells that were treated with the GNPs bonded to the peptide had a higher quantity of GNPs in the cell than those treated without the peptide, indicating that the peptide increased the efficiency of treatment delivery to the cancer cells. Guo did most of his work at Villanova University and had imaging help from area companies CytoViva and Janssen Pharmaceuticals. Guo would like to continue his research to show people that there are new, novel approaches to targeting cancer, and he hopes to one day become a doctor. The Chester County Science Research Competition is a feeder fair for the Delaware Valley Fair, which will be held at The Greater Philadelphia Expo Center at Oaks on April 3-5. The competition will include approximately 1,000 students from Delaware, New Jersey and southeastern Pennsylvania. Students competing at the Delaware Valley Fair will have the opportunity to win their share of nearly $1 million in college scholarships as well as move on to the International Science and Engineering Fair being held in Pittsburgh, PA this year. For a complete list of 2018 award-winners, please visit www.cciu.org/CCSRCawards.